The Justinian Society and the Criminal Justice Section of the Philadelphia Bar Association hosted the 12th Annual Beccaria Award Ceremony honoring David Rudovsky, Esq. 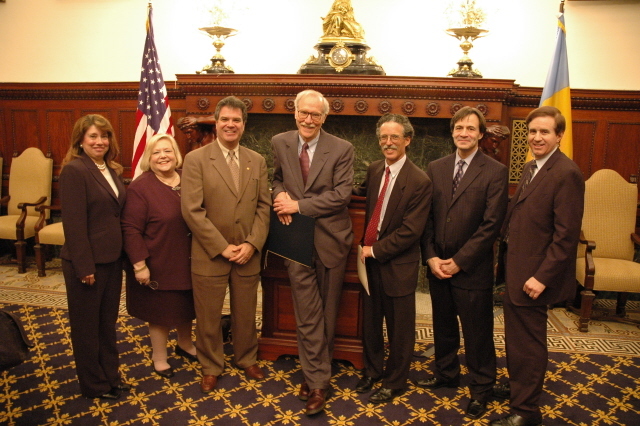 of Kairys, Rudovsky, Epstein & Messing, on January 18, 2006 in City Hall. Rudovsky has been a partner in the Philadelphia law firm of Kairys, Rudovsky, Epstein & Messing LLP since the firm’s founding in 1971. He specializes in civil rights, civil liberties, and criminal defense litigation. The Beccaria Award represents the highest honor that the Justinian Society in cooperation with Criminal Justice Section of the Philadelphia Bar Association can give to any member of the Bar, whether or not a member of the either Section, who exemplifies the ideals of the career of Cesare Beccaria. Beccaria was an 18th century Italian scholar whose writings presaged the dawn of the modern penal system. This year’s award recognizes Mr. Rudovsky’s distinguished achievement in the field of education in criminal justice. Photo Caption: From L to R: Christine G. Cavalieri, Esquire, 2005 Beccaria Award Committee Chairperson; Judith F. Rubino, Esquire, Former Chair, Criminal Justice Section of the Philadelphia Bar Association; Daniel-Paul Alva, Esquire, Chair of the Board of Governors, Philadelphia Bar Association; David Rudovsky, Esquire, 2005 Beccaria Award Recipient; Jules Epstein, Esquire, 2003 Beccaria Award Recipient; Gaetan J. Alfano, Esquire, Chancellor, The Justinian Society; and the Honorable Denis P. Cohen, Judge, First Judicial District of Pennsylvania, Philadelphia Court of Common Pleas (photograph taken by Michael Mountain).